Variety of cosmetics, skin care, and fragrances, from companies worldwide. Get Free US Standard Shipping on over $70. Get $20 off $99 on Suisse Programme Hero Items! 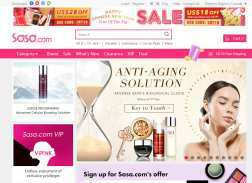 Get up to 51% off RRP legendary brands of Sisley and Elizabeth Arden. Applicable to selected items. Receive 5 pc Gift with Any purchase. 5 pc Gift will be randomly selected while stock last. Get Up to 53% off Hot Pick Items. Get Up to 88% off Beauty Supplements & Slimming Products. Get up to 90% off Fitness Plan. Fitness Plan includes Skincare, Slimming & Fitness, Other Care. Get up to 95% off RRP on clearance items. Get $40 off $169 on Suisse Programme Hero Items! Up to 50% off select toners. Limited time offer.